There are many reasons to grow herbs and many herbs to grow. But most gardeners confine themselves to just a few favorites: basil, mint, chives, rosemary, oregano and thyme. 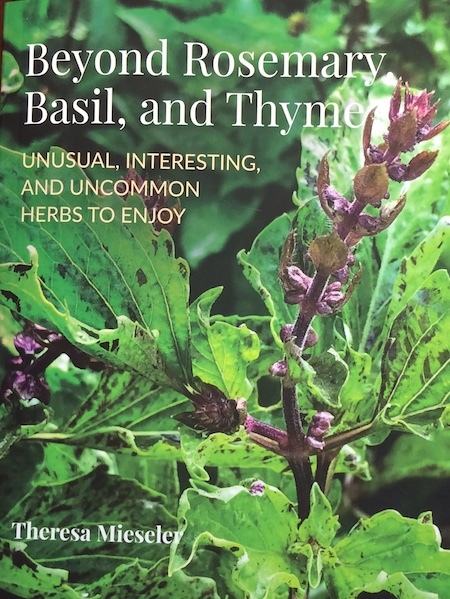 In her book Beyond Rosemary, Basil and Thyme: Unusual, Interesting and Uncommon Herbs to Enjoy, Minnesota author Theresa Mieseler encourages gardeners to expand their herb knowledge and adventurousness. Porterweed? Moujan? This book covers unusual herbs as well as more popular culinary herbs for the garden. Mieseler owned Shady Acres Herb Farm in Chaska with her husband Jim for more than 40 years, and was a well-known vendor at the Minneapolis Farmers’ Market. She was also a popular speaker at garden events here and worked at the Minnesota Landscape Arboretum for many years. That’s a long way of saying, she knows her herbs! After a brief introduction, Mieseler goes herb-by-herb through edible, ornamental and medicinal herbs. She’s quick to point out which herbs are not for eating, which I appreciated, as some of the herbs listed are not plants I’d considered herbs until reading this book. Those include Korean angelica (Angelica gigas), which is used medicinally in parts of Asia, and Vietnamese gardenia (Kailarsenia lineata), which Meiseler grows exclusively for scent. While some herbs she discusses are unusual, she includes information on more common ones, too, such as basil and oregano, often highlighting lesser known varieties. She also recommends herbs that are definitely not rare but probably should be planted more, such as chervil, lovage (a favorite of mine) and lemon verbena. Mieseler’s extensive knowledge shows throughout the book. She recommends varieties, offers propagation advice, includes information on drying and preserving herbs and making herb blends, and includes an abundance of recipes for using herbs in cooking and in creating sachets and even “tussie mussies,” 19th century bouquets given to others who understood the meaning behind the flowers and herbs. There are photos throughout of herbs, the recipes and herbs used in garden settings. I was especially glad to see that she included a resource listing in the back of the book for use in finding some of the more unusual plants. This is a self-published book, and as someone who ventured into self-publishing years ago, I can tell you it’s a darn good one. At the moment, it is available through the Shady Acres Herb Farm website, at the Minnesota Landscape Arboretum store and through Amazon as well as at events where Theresa Mieseler is speaking. Disclaimer: I was given a free copy of this book for review purposes. My policy is to only review books I like. If I don’t like it, I don’t review it.